We are, each of us, a product of place, so sometimes our environment creeps into our psyche more than we care to admit–I was reminded of this fact by an unassuming apple in my front flowerbed. A flowerbed that sits before a very old house, built of red stone, hand-hewn and crooked; a house that is, by turns, lovely and eerie. 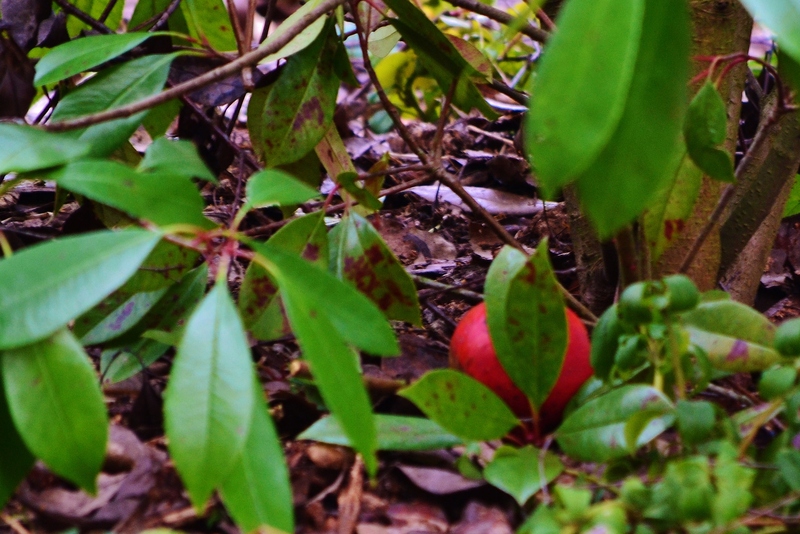 I walked out the front door of my house and saw the apple there–red and vibrant among the few green leaves that still cling to the frozen branches of those front bushes. A bright spot of color in the largely barren tones of winter, it was a welcome sight. But how did it get there? There is no apple tree in the front yard, and the apples from the back yard are small and earth-toned by comparison. Where did this gem come from? Where my mind should have wandered in its answer is to my children. “Who walked out the front door and threw their lunch apple into the bushes?” That’s the logical question. But I’ve been reading that German classic, the Brothers Grimm, and traveling to the Black Forest and various sundry towns mapped out in labryinthine streets of half timbered houses. The sorts of places that both delight and unsettle the pysche as night falls. . .the sorts of places where Santa makes the rounds with his sinister cohort Krampus in tow. So where did my mind go as my eyes fell on the apple? The gypsy woman who had knocked on our front door the weekend before. That had never happened before, and it was a little unsettling. My husband answered the door, but couldn’t understand anything she was saying. Was it German? Was it some other language, something Eastern European? Who knew? He kindly, firmly sent her away without whatever she had come for. 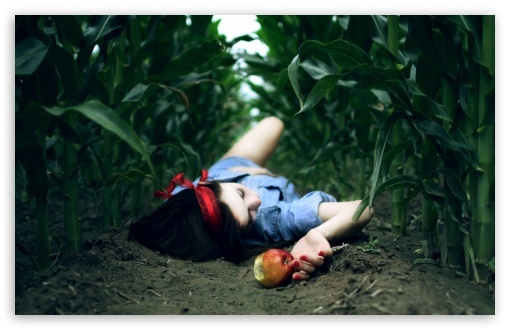 And here we were the next day, with a lone apple in our front flower bed–red, shiny, seductive in the barren patch. Like a riddle she left behind. It’s still sitting there. Part of me knows that this is a silly flight of fancy. But part of me wants to run out and take a giant bite of it, just to see what magnificent story would begin to untangle in the moment of that fateful taste. Give it a bite and see what happens!